Alabama’s bioscience industry is robust, and key indicators show the sector is growing to support new, high-paying jobs, according to a report from TEConomy Partners LLC and the Biotechnology Innovation Organization, or BIO. The “Value of Bioscience Innovation in Growing Jobs and Improving Quality of Life 2016” Report examines metrics including the number of employees and companies in the field, wages, academic research and development expenditures, patents, and venture capital investments. 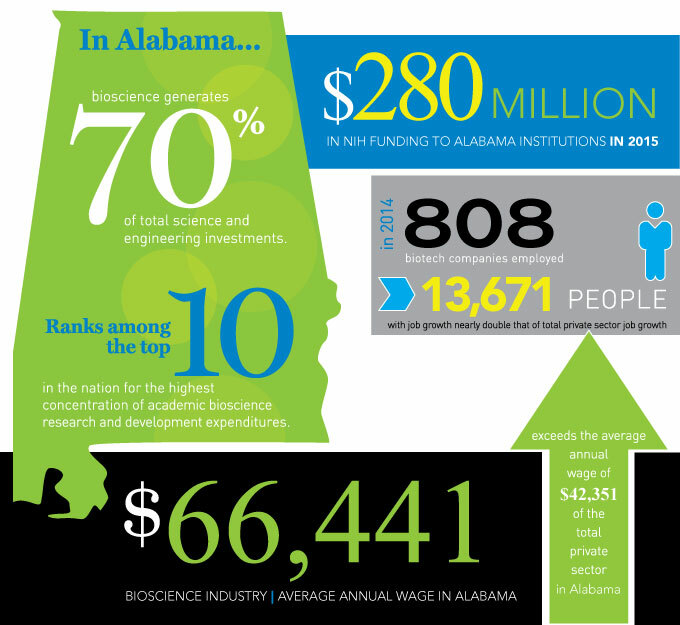 Alabama’s bioscience industry employment totaled nearly 14,000 people at 808 companies. Bioscience generates more than 70 percent of total science and engineering investment in Alabama, ranking the state in the top 10 nationally for the concentration of academic bioscience R&D expenditures. Alabama also ranked in the top 10 states in the growth of National Institutes of Health funding in 2015, with $280 million, an increase of 10.7 percent from the previous year. Venture capital investment in the state has totaled $101 million since 2012. The report was released at the BIO International Convention in San Francisco this month. An Alabama delegation including state bioscience leaders and company executives attended the conference, which is the biotech industry’s largest trade and networking event. “The biotechnology and life sciences industries have proven their value in generating important innovations that improve quality of life and creating high paying jobs in our state,” said Ted Clem, director of Business Recruitment and Retention Office at the Alabama Department of Commerce. “We are encouraged to see our work in the bioscience industry validated in this report and remain focused on bringing more bioscience companies and jobs to the state,” added Clem, who attended the conference in San Francisco. BioAlabama, an organization representing the industry in the state, said bioscience growth in the state is being driven by three key sectors: drugs and pharmaceuticals; medical devices and equipment; and research, testing, and medical laboratories. BioAlabama noted that the TEConomy/BIO report pointed to several metro areas that ranked highly on important performance measures. The Auburn-Opelika area was highlighted as one of only 32 metros in the nation with specialization in at least three of five bioscience subsectors. Mobile has the sixth highest specialization among medium markets in agricultural feedstock and chemicals, while Decatur ranked ninth among small markets. Huntsville ranked No. 8 among medium markets in research, testing and medical laboratories, and No. 11 in drug and pharmaceutical specialization. “This report demonstrates the growing importance of biotechnology to our state economy,” said Carter Wells, a BioAlabama board member and vice president for economic development at the HudsonAlpha Institute for Biotechnology.